Christian Moody, once called the best walk-on in the history of college basketball, is now working for a non-profit group. Christian Moody, KU graduate, is the Public Relations Development Director at the Leo Center in Lawrence. Christian Moody’s contributions to the men’s basketball team during his four years on campus earned him the unofficial title as the best walk-on in the history of college basketball by CBS analyst Billy Packer. Moody’s basketball days are done, but now he’s contributing to the community. He serves as the development director at the Leo Center, a non-profit organization that provides food and medical care for those in need, in the Riverfront Plaza. His responsibilities at the center include planning fundraisers and informing the public about the organization’s mission. Several local churches support the center and much of its care centers around Christianity. Moody said he had applied to the University of Kansas Medical Center and said the volunteer work he was doing now would help his chances of being admitted. 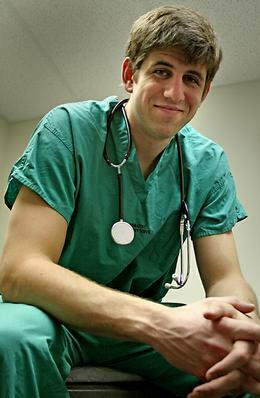 He chose to seek experience at the center because of the clinic’s mission of providing care for those in need. “I’ve just been learning so much, not just about the medical side but giving people hope in general,” he said. Moody recounted a specific instance when a woman brought her two grandchildren, both girls in their early teens, into the clinic. Their father was in prison and their mother was having personal problems, leaving them to live on the streets in Dallas for six months. Though their grandmother wanted to help, she was living on a fixed income and could not afford to support the girls. She turned to the Leo Center for help, and the center provided the girls with medical checkups, counseling, beds, dressers and clothes to ease their grandmother’s burden. “They came up here pretty much just with the clothes on their backs and helping them was just an awesome thing to see,” Moody said. Generosity does have a price, though. Jay Gray, who is in charge of billing for the center, said the medical clinic recently stopped allowing patients to accumulate unpaid balances because some took advantage of it. He said a first time office visit cost $42 and subsequent visits were $30. X-rays are $45 and most lab work is between $20 and $60. For those without insurance, which Gray said made up 90 percent of his patients, it is much less expensive to seek treatment at the center than at a hospital or doctor’s office. The way the human body works; it’s incredible how God put it together and how he allows us to fix it when it messes up. Staff at the Leo Center have to pinch pennies at times to keep things running. Moody apologized for the dark hallway leading to his office and explained that the lights were off to save money. It’s a long way off from the lush life that the NBA provides for some of his former teammates, but Moody’s interest in medicine goes back to before he even stepped foot on the court at Allen Fieldhouse. While still a high school student in Asheville, N.C., he attended a leadership conference in Washington, D.C. There, he watched a surgeon perform operations on a brain and a heart, as well as a hip replacement, and decided he wanted to do the same someday. “The way the human body works; it’s incredible how God put it together and how he allows us to fix it when it messes up,” he said.